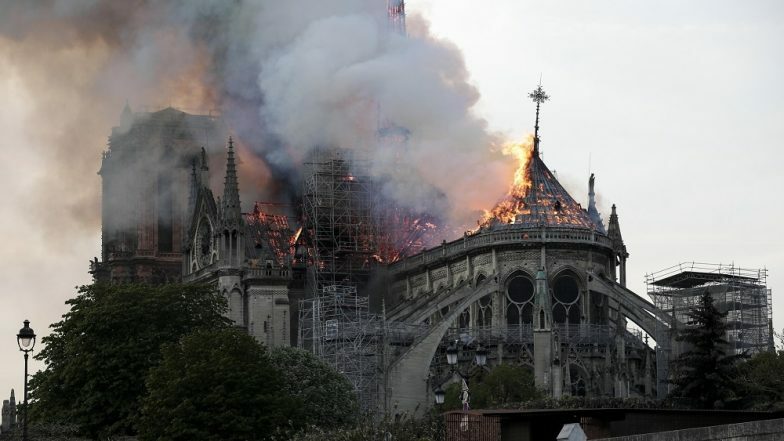 New York, April 16: The New York Police Department (NYPD) was trolled mercilessly on Twitter after it posted about "closely monitoring" the fire at the iconic Notre Dame Cathedral in Paris. "We are closely monitoring the fire at the #NotreDame Cathedral in Paris, France... As our followers know, we tweet immediately about most large scale international events to inform you, as we assess how they may or may not impact NYC," NYPD's Counterterrorism Bureau tweeted on Monday. After the tweets, NYPD was mocked by social media users with one asking: "what is the risk of it spreading to the US." "How does Game of Thrones season 8 impact NYC? Thank you in advance, I'll take my answer off the air," tweeted another user. YouTube Mistakenly Links Paris Notre Dame Cathedral Fire to 9/11. As our followers know, we tweet immediately about most large scale international events to inform you, as we assess how they may or may not impact NYC. Some of the other interesting responses on the NYPD's tweets were: "I just saw someone throw litter out of their car window here in Canada. Are you on the case?" "I never realized fire is a sentiment and could fly across the Atlantic Ocean."